In 2016 a Michigan State University professor released research arguing that school choice policies make the effects of declining enrollment worse, creating a “fierce downward spiral” for urban districts with low-income populations. But the claim of financial stress missed the trend of fewer districts falling under the state’s watch list due to poor financial health. Despite the good news about districts’ finances, some local education leaders have declared their grievances about school choice. In May, several superintendents complained to the Michigan Civil Rights Commission. Their argument: The departure of many students for other options was depriving them of a fair share of resources to help those who have been left behind. One official reportedly suggested letting districts keep $2,000 for each local student who transfers away. Some school district insiders remain bent on painting public charter schools and inter-district choice programs as culprits. 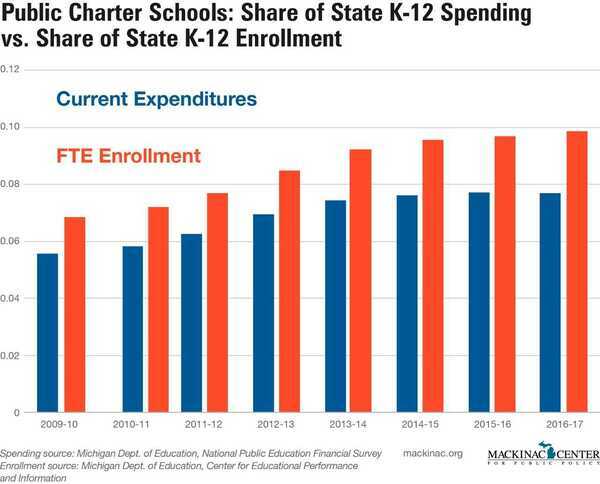 But they, along with policymakers, would be wise to consider the best research that shows the academic benefits of attending Michigan charter schools. They should also listen to the overwhelmingly positive opinions of the parents whose children have taken advantage of educational opportunities outside their assigned district. Some families want and need an alternative, and they can’t afford to relocate. Yet what about the students who are left behind? The news publisher MLive recently ranked Michigan school districts by the percentage of public school students who live in the district but are enrolled elsewhere. If critics are correct, the districts where residents prefer choice — that is, where majorities or near-majorities of students enroll in other public schools — are those most likely to suffer. 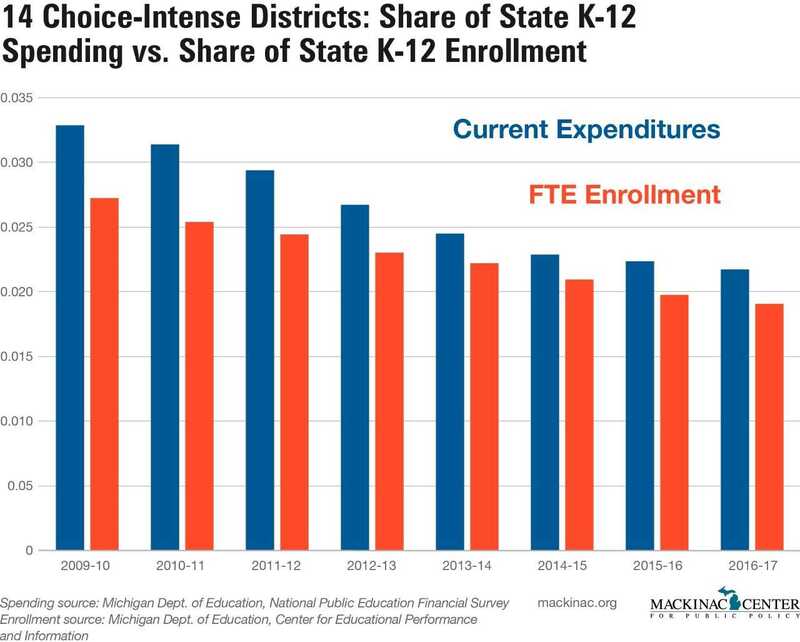 Not surprisingly, 14 of MLive’s 15 districts with the largest net enrollment losses have seen an increasing number of local residents exercising choice over the past eight years during which the state has tracked this data. (The only exception, the Detroit Public Schools Community District, has actually seen a slight drop in the number of departing students. All of its lost enrollment appears to be attributed to people moving out of the city.) In total, the number of students leaving these districts for another district or a charter school increased 59 percent between 2010 and 2018. It may be difficult for districts to adapt to smaller budgets in the short term, but having fewer students generally means having fewer expenses. On a per-pupil basis, these districts’ total revenues have grown slightly more than inflation while their operational spending has declined slightly. Detroit, where the enrollment losses are the result of people moving away, hasn’t fared any better. But consider this: In 2010, the 14 districts spent over 20 percent more than what their share of student enrollment would suggest. 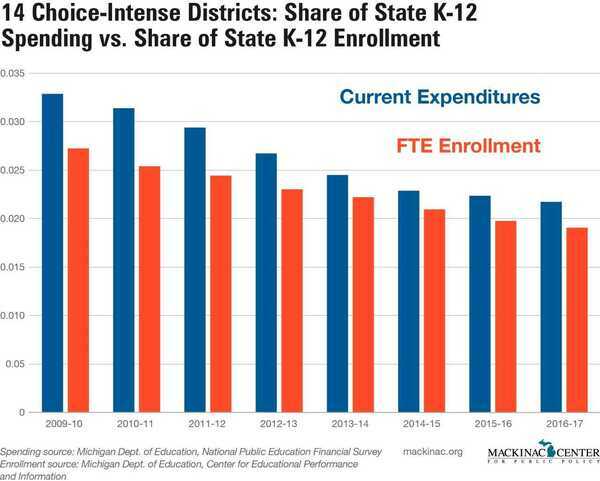 They served 2.7 percent of Michigan’s K-12 public school students but spent about 3.3 percent of Michigan’s K-12 public dollars. Seven years later, these districts still spend nearly 14 percent above the state average. 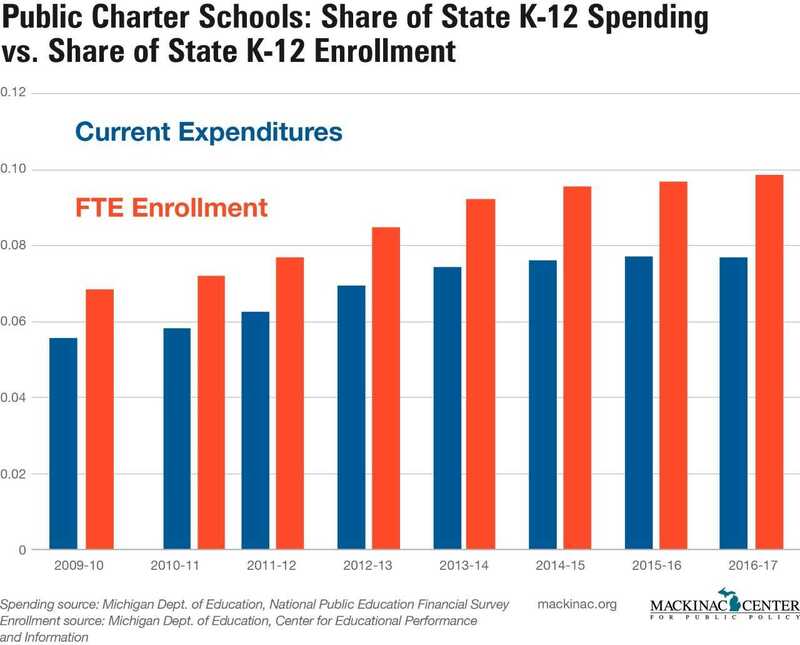 As was the case with the 14 choice-intense districts, per-pupil spending in Michigan’s charter schools changed very little from 2010 to 2017. But unlike those districts, charters have consistently spent between 18 and 22 percent less than their share of enrollment. Charter schools have no access to local property taxes and tend to get fewer federal dollars. Yet that has not hindered families who flock to them for results and opportunities.